Google's skunkworks "X" lab is building a contact lens that can monitor glucose levels in the tears of diabetics, and warn them when it drops too low. The wireless-communicating device was unveiled by Google in a blogpost on Thursday, and may also one day contain tiny LEDs that'll light up if the wearer becomes hypoglycemic. "We're now testing a smart contact lens that's built to measure glucose levels in tears using a tiny wireless chip and miniaturized glucose sensor that are embedded between two layers of soft contact lens material," the internet kingpin explained. "We're testing prototypes that can generate a reading once per second." Though the technology is in its "early days", Google says it has completed multiple clinical research studies that refined the prototype. "We hope this could someday lead to a new way for people with diabetes to manage their disease," the company added. Numerous other companies have worked on similar technologies, including Sensimed, which uses sensors embedded in a contact lens to measure intraocular pressure for Glaucoma sufferers. As diabetes affects one in every 19 people on the planet, though, there's a good chance that if Google gets its gear past the regulators, it could make a tidy sum off of the tech, and not be so dependent on its core advertising business – which is being bitten by declining ad profit margins. Google disclosed very little about the tech aside from saying it used "chips and sensors so small they looked like bits of glitter, and an antenna thinner than a human hair." 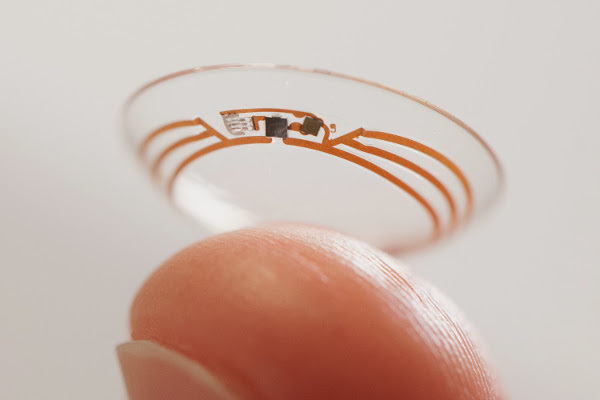 Google hopes to partner with companies to help it develop the smart contact lens and applications to help the wearers and doctors make sense of its measurements. Given Google's recent buy of home automation expert Nest, and last year's splurge on various killer-robot companies, the Chocolate Factory is spending big bucks on speculative technologies that may one day dwarf its ad business.